University of Alberta physics professor Craig Heinke has solved a mystery that lies 11,000 light years beyond Earth and has puzzled astronomers for years. When a supernova, or exploding star 20 times heavier than our sun, blasted apart, it left behind a small core, a 20 kilometre-wide remnant, which Heinke and a colleague identified of as a neutron star. It's the youngest neutron star ever identified, and its atmosphere, a thin layer of carbon, is one of a kind. 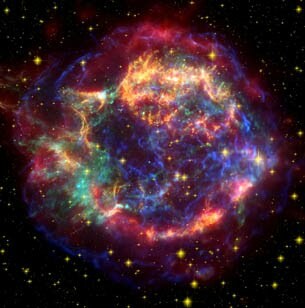 The mystery began unfolding more than 300 years ago when a star, now known as the Cassiopeia A supernova, literally lit up the universe. Heinke says the stars transition to supernova was a colossal explosion producing light as bright as all 100 billion stars in our universe. "The death of a star is that violent," said Heinke. "It took centuries for the dust to settle and when it did, just 10 years ago, the star's mysterious core was revealed." The researchers used data from NASA's Chandra X-ray Observatory satellite. "X-ray imaging only sees the hottest things in the universe, such as neutron stars, and the material that falls into a black hole," said Heinke. "The neutron star we identified had a temperature of roughly a million degrees Celsius; that's 3,000 times hotter than boiling water." Heinke eventually concluded that the core is a neutron star and that its unusual carbon atmosphere is due to its young age. Up until now researchers have only had much older neutron stars to examine and none of them had a carbon atmosphere. Heinke says it was the carbon atmosphere that caused a lot of confusion for astronomers. "The images sent back to Earth by the Chandra X-ray satellite simply didn't look like any neutron star pictures researchers had ever seen before," said Heinke. Heinke's breakthrough reveals part of a neutron star's life cycle that had never been seen before. Heinke and his collaborator, Wynn Ho of Southampton University in the United Kingdom, have published a paper on their research. It will be published this week in the prestigious journal, Nature. "This discovery helps us understand how neutron stars are born in violent supernova explosions," said Heinke. "This neutron star was born so hot that nuclear fusion happened on its surface, producing a carbon atmosphere just 10 centimetres thick."